The style of New York and the charm of Long Island extend throughout Melville Marriott Long Island. Located near the city of Huntington, our hotel provides a central location to numerous destinations including Adventureland, Bethpage State Park and Walt Whitman Shops. The hotel is also within minutes of the offices of Canon and Nikon. Retire after an afternoon of meetings and adventures in our stylish rooms and suites. Relax in our accommodations and unwind on our plush pillowtop beds boasting a central view of the wall-mounted flat-panel TVs. In your free time, lounge in our newly renovated lobby or visit our recently updated restaurant and bar, Great Room. Our hotel also includes a convenient restaurant with refreshments that can be enjoyed in your room or on the go. When you wish to cool off, swim in our indoor pool boasting atrium windows and ample lounge chairs. 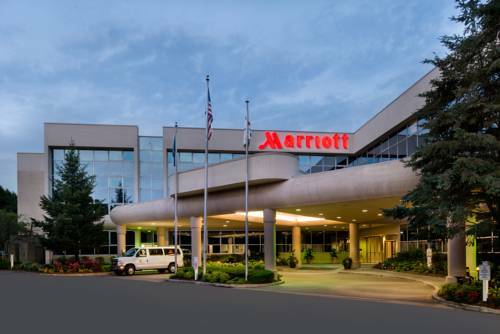 Whether visiting clients or getting away for a weekend, Melville Marriott Long Island makes your stay as easy as possible. Great Room Restaurant: The newly renovated Great Room serves fresh, American entr es for you to enjoy. Start your morning in Melville, New York with a delicious breakfast or join us in the evening with a delightful dinner and hand-crafted drinks in a stylish atmosphere. Great Room Lounge: Great Room Lounge is the ideal destination for romantic gatherings or friendly meals. A delightful selection of refreshments await in our recently modernized restaurant. Join us for a drink before a night out or after a celebration in Melville. Fresh Bites: In-Room Or On-The-Go: Authentic, locally sourced food without the fuss can be found in our convenient eatery, Fresh Bites. All orders include eco-friendly utensils, napkins and cups. Enjoy your meal in the comfort of your room or grab a quick bite before heading out.